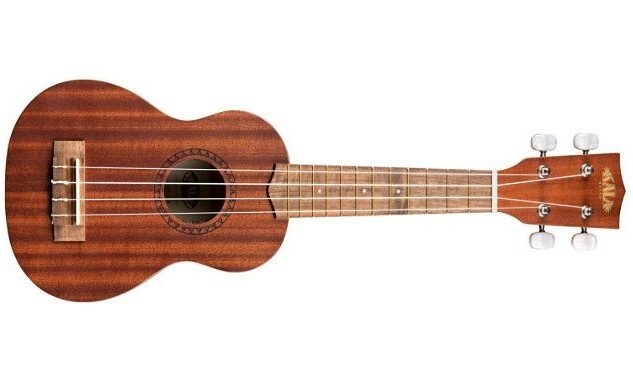 What’s a soprano ukulele? How big is a soprano ukulele? These are just some question we will answer in our review of the top 5 best soprano ukuleles. We’ve picked the models that are decently affordable, that excel in the field of performance, and that (generally) look beautiful. A standard Soprano ukulele is usually 21” long, and the standard material used in the manufacturing process is often Mahogany. These ukuleles have fret markings at either 5th, 7th, and 10th, or 7th, 9th, and 12th fret position. You can get an entry level Soprano ukulele at a very reasonable price, but moderately priced models cost around $50 and up. Expect to pay in the hundreds for a higher quality instrument. Kala’s KA-15S Mahogany Soprano ukulele is one of the best soprano Uke models on the market. The KA Mahogany series include Red, Baritone, Concert Soprano Ukulele, Hawaiian Islands, Limited Edition Soprano Ukulele, Soprano Ukulele, Spruce, and Tattoo Band variations. This ukulele’s body & neck are made of a beautiful mahogany, the bridge & fingerboard are made of premium-quality rosewood, and it comes with twelve brass frets – with markings at the fifth, seventh, and tenth fret. This ukulele comes strung with the Italian Premium-Quality Aquila Nylgut ukulele strings. It’s decently affordable ukulele, but it’s not cheap. All in all, it holds a phenomenal value for the cash. Diamond Head is one of the prominent leaders in the music gear industry, and DU-150 Soprano Ukulele is proof of their dominance. This budget ukulele can easily compare to some more expensive ones, both in terms of aesthetics and performance. 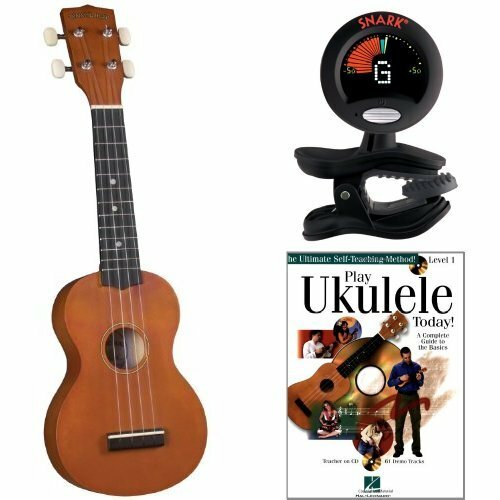 Bundle comes with the ukulele, a clip-on tuner and a instructional book, "Play Ukulele Today" from Hal Leonard. Donner’s Soprano Mahogany DUs-1 21” ukulele is a vintage soprano ukulele bundle. It features a traditional body design, it comes strung with high-quality carbon-nylon strings, and a beautiful vintage mahogany body. The neck is also made of mahogany, and it further complements the exquisite sound output. Donner equips their patented guitar-style tuners on their ukuleles, and it’s safe to say they’re great – they won’t let your ukulele go out of tune. This good soprano ukulele is a bit longer than your standard uke, as it features fifteen brass frets. The fret marks are at the fifth, seventh, ninth, and twelfth fret. 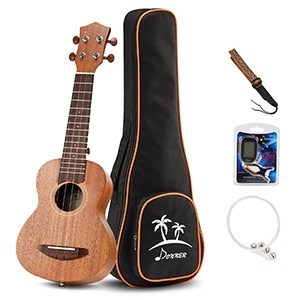 This set comes with a ukulele ﻿﻿strap, gig bag, nylon strings and a tuner. 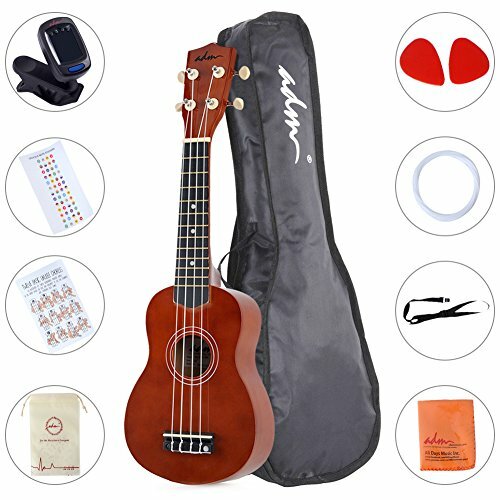 ADM’s 21” Economic Soprano ukulele bundle is a cheaper option to consider. It’s available in five different colors – black, blue, purple, pink, mocha and brown (pictured). Each color model is outfitted the same. This ukulele features a beautiful mahogany body and head, along with a rosewood fretboard with twelve brass frets. The fret marks are painted on fifth, seventh, and tenth fret, so that you can catch cords more easily. The bundle includes the ukulele, a gig bag, picks, a strap, extra strings, a chord chart, clip-on tuner and fingerboard stickers for beginners. Makala’s MK-S soprano is one of the best moderately priced soprano ukuleles on the market. It features an Agathis wooden top and body construction, a rosewood fingerboard & bridge, a mahogany neck, and twelve brass frets, with the fret markings at fifth, seventh, and tenth fret. It boasts supreme playability, it’s very durable, but the only downfall is that it costs a bit. This is not a deal breaker, though – this uke is extremely beautiful, and we guarantee that you’ll have a lot fun playing it. 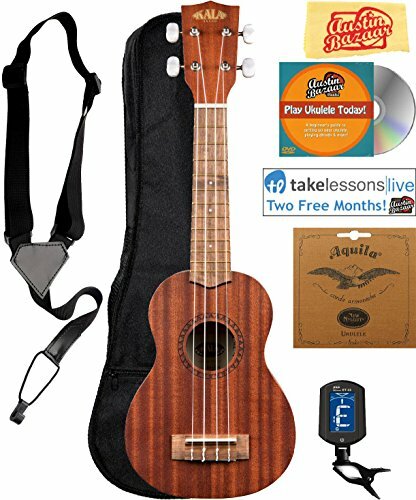 The bundle includes the ukulele, a gig bag, strap, a clip-on tuner, an extra set of Aquila strings, apolishing cloth, 2 months of online lessons and an instructional DVD from Austin Bazaar. Finding a good soprano ukulele isn’t hard – you have some of the best models right in front of you, and all you have to do is decide which one you like the best. Of course, you could always do some research on your own, but the market of Soprano Ukuleles is pretty vast. There’s always a better model, a more beautiful one, or a more expensive one because the manufacturers introduce new models every day.